Many cabins have water issues in their basement or crawl spaces. Our cabin is no exception – especially in the spring or after heavy rains. 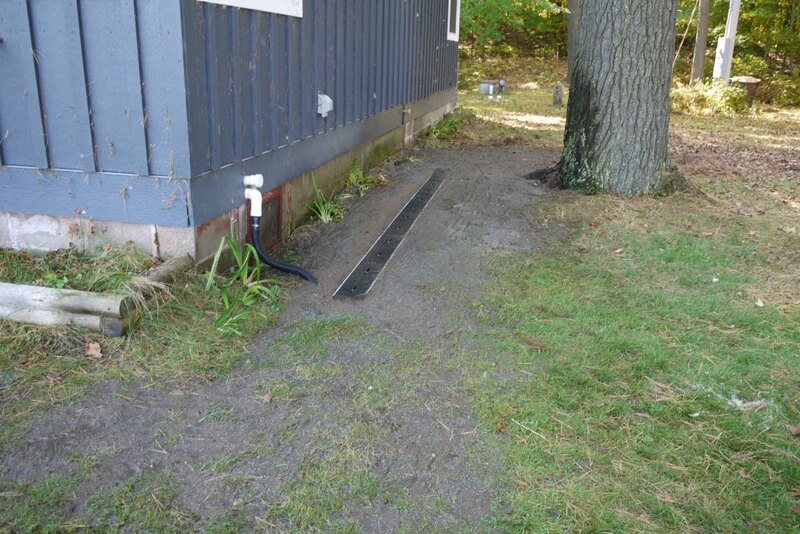 To fight the water, we installed a foundation french drain and a channel drain system to help keep our crawl space dry. If you’ve read some of my other articles, you probably know I’ve put some time and effort into mitigating crawl space moisture issues. Those efforts include the installation of a crawl space sump pump and an active vapor barrier encapsulation system for our cabin. While these two measures actively remove water once it enters the crawl space, they do nothing to keep the water out in the first place. 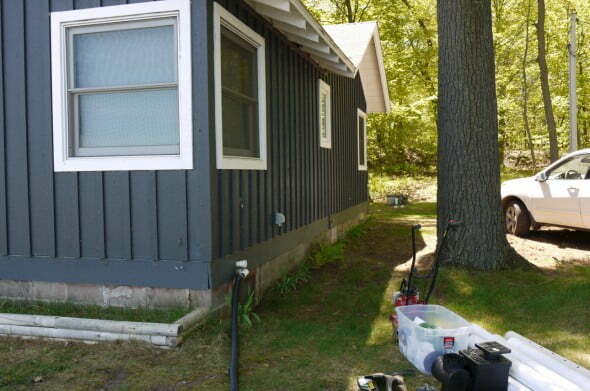 Water issues within a crawl space or basement often originate outside of the space. 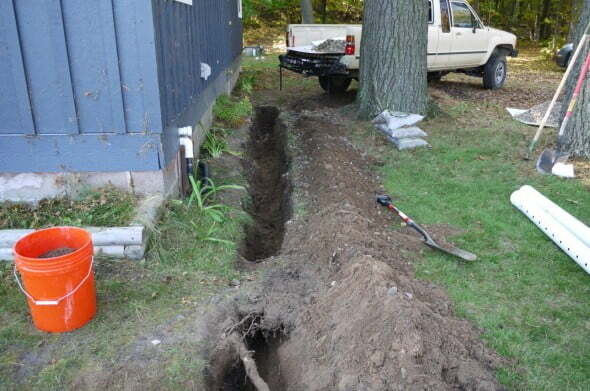 This project aims to stop the water before it enters your crawl space or basement. Each of the above are unique problems and should be addressed separately. Issues with humid exterior air ventilation are fixed by sealing your crawl space to outside air. 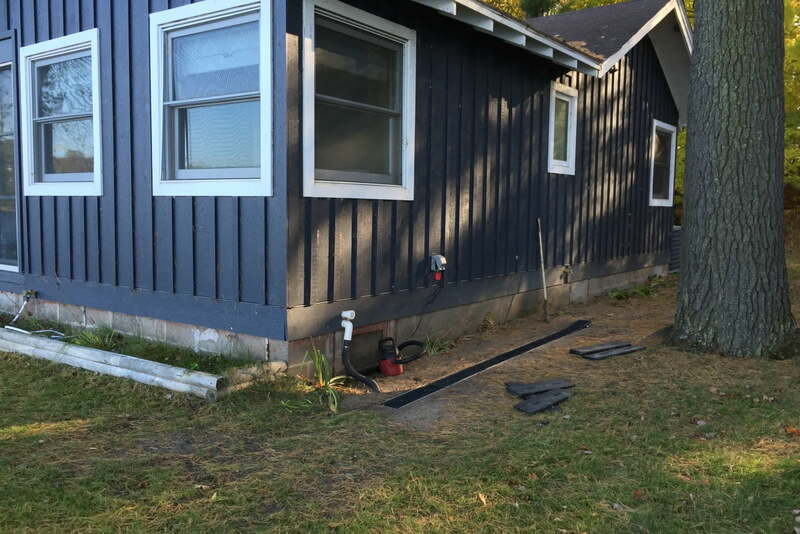 I have already done this by sealing the foundation vents in my foundation walls with block (more details above sealing your crawl space here). Fixing problems related to ground and sub-surface ground water (problems #2 and #3 above) can be accomplished with drains that divert water sources before they can pass into your crawl space or basement. For sub-surface water, install buried drains (French drains) to de-water deeper soil and reduce hydrostatic forces and for surface water, install surface drains to divert water before it reaches your foundation walls. French drains are trenched drains lined with aggregate (gravel, sand, etc.) with or without buried drainage pipe or tile used to divert sub-surface water. 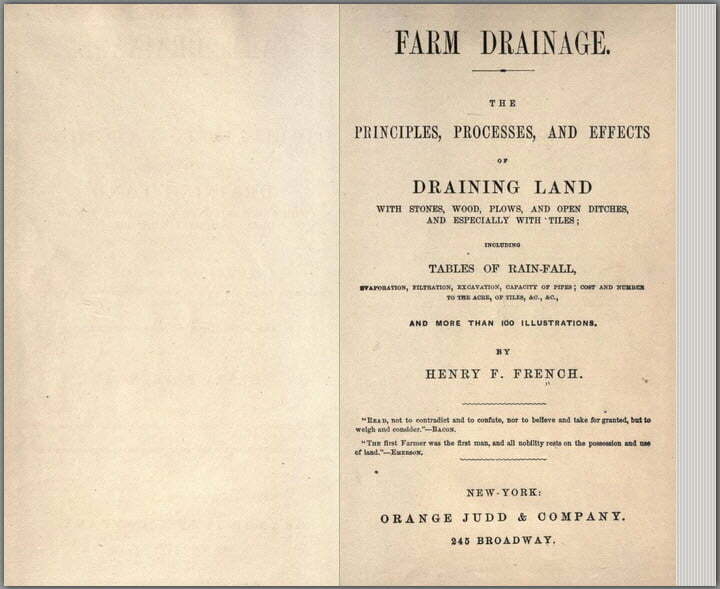 French drains are named after an early American farmer, Henry French, who described and popularized them in his book, Farm Drainage. 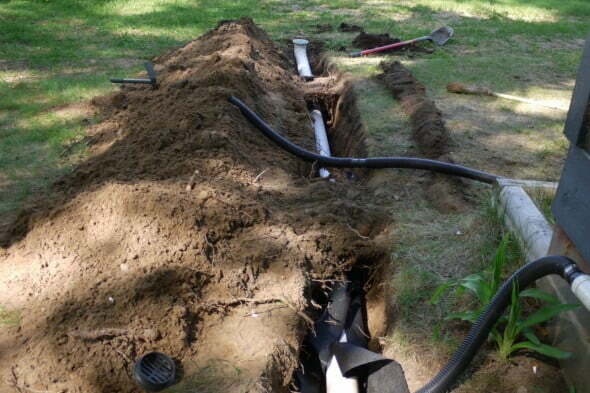 Many different types of French drains are in use today and are often named for the drain location and or function. Examples include; curtain drains, perimeter drains, interceptor drains, and foundation drains. Curtain drains are French drains used to protect areas adjacent to elevated or perched water tables (like at the base of wet hill). Perimeter drains are French drains that surround the area to be protected. 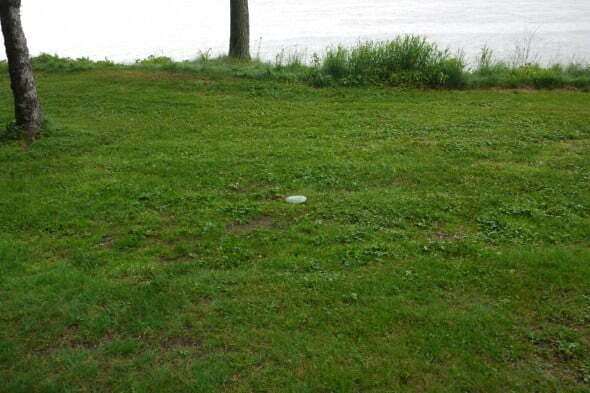 Foundation drains are placed near the base of a building or home to protect the foundation. 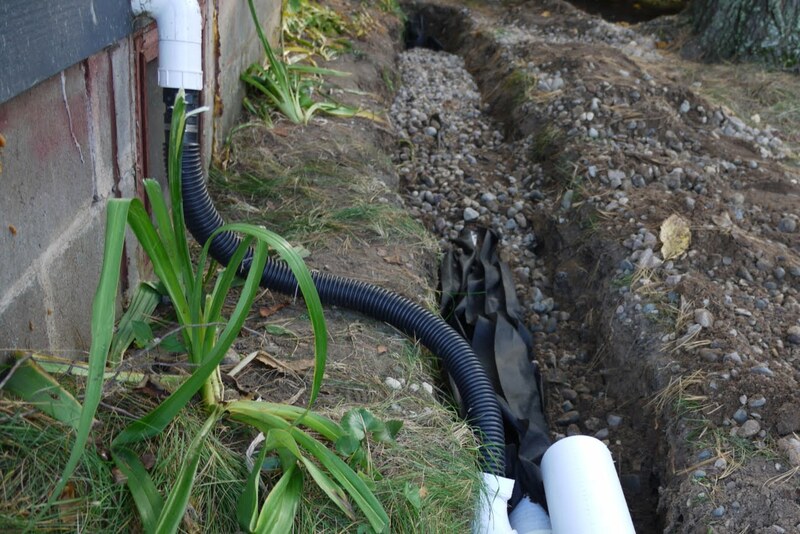 Although there are many types of French drains, all share the purpose of controlling sub-surface water. French drains should not be used to control surface water that should be diverted from the surface before reaching deeper soils and potentially contributing to sub-surface water that the drain is attempting to remove. 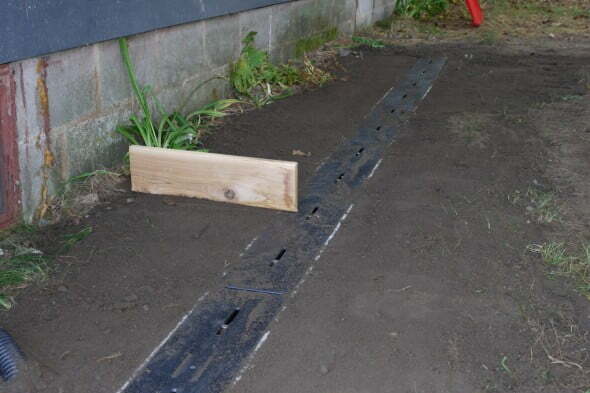 Surface water from roof runoff, snow melt, and other landscape run-off should be controlled using surface drains. Surface drains simply catch and redirect surface water. There are many varies of drain types, often named for style and location. Channel drains provide a narrow channel to divert water. Trench drains are surface drains that interrupt the movement of water across a surface. Catch basins are reservoirs placed at a specific location in need of drainage. Our cabin lacks roof gutters and has a rather flat, poorly sloped yard. Rainwater, roof run-off, and snow-melt create fairly regular surface and sub-surface water assaults to our cabin’s crawl space. With both surface and sub-surface water issues, I will need a plan that addresses both the surface and sub-surface water keep our crawl space dry. Gutters discharging water too close to the home’s foundation. 1. Surface water from roof run-off. Our cabin is gutter-less leading to an enormous amount of water dumped next to our cabin every time it rains. (each inch of rainfall a 1,000 sq ft roof will shed just over 623 gallons of water! 2. Sub-surface water from saturated soil. Seasonal changes in soil water plus excess ground water charge from surface water, snow melt and slope issues can all lead to excess soil moisture. 1. Surface channel drains to divert surface water and act as in-ground gutters. 2. Sub-surface (French) drains to control sub-surface water and de-water wet soil. To limit the amount of trenching for the project, I plan to place both drains in the same trench. 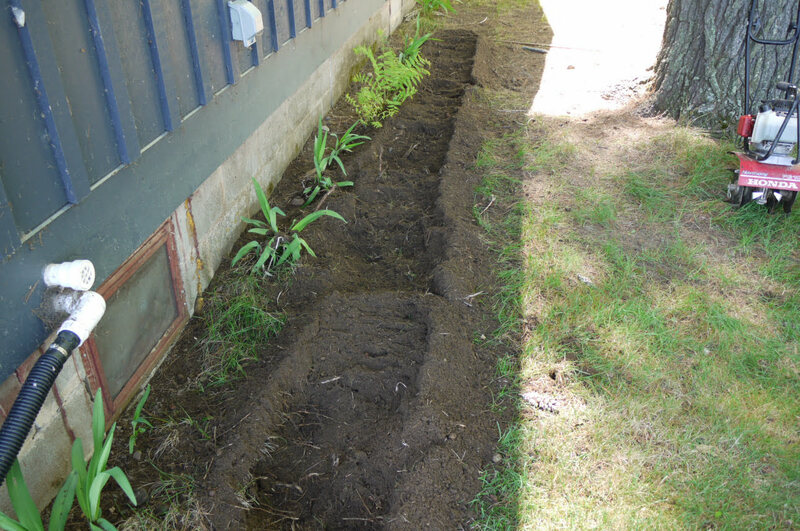 At the base of the trench, I will install a French drain. At the top surface of the trench, I will install a channel drain. Each drain will perform its particular job and empty into a shared discharge circuit. Install and connect discharge circuit. Finish surface over drains and trenches. Drain Pipe -solid for discharge circuit $10 ea. Based on the goals your are trying to attain, plan and size the drainage system for your particular situation. 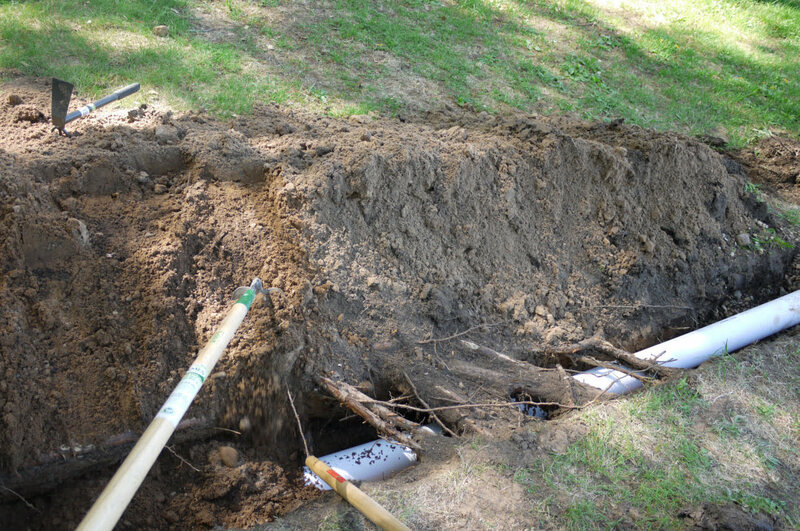 French drains drain sub-surface water, surface drains drain surface water, and combined systems do both. Remember to call before digging to identify any buried power lines, plumbing or gas lines! Assemble the necessary tools and materials for the drain and discharge circuit construction. 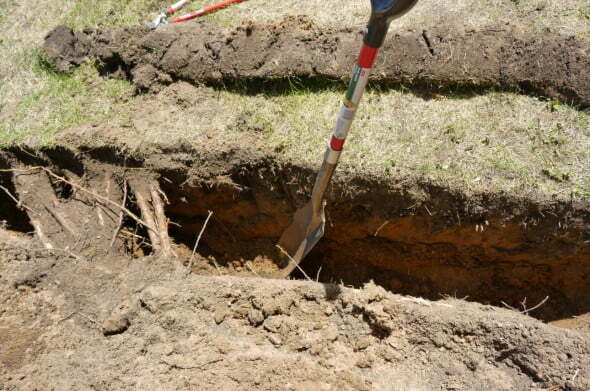 You will need several shovels at the very least to dig the trench. I found the use of a mini rototiller helped get through the top layer of the ground when digging the trench. Rent power trenchers for larger projects. Many different types and styles of drainage pipe are available. I choose 4″ triple wall smooth HDPE bell end drain pipe – perforated for the drain field and solid for the discharge circuit. Black corrugated ADS drain pipe is cheap and readily available, but I would not use it. The pipe crushes easily, and the corrugations can trap sediment eventually block the pipe. Various fittings and accessories are available to use with the 4″ drain pipe. DWV (thin wall) 4″ PVC pipe fittings will fit the HDPE pipe and are readily available. Catch basins, drain fittings, pop-up emitters, and other accessories are available from several manufacturers (NDS is a quality manufacturer and easy to find). 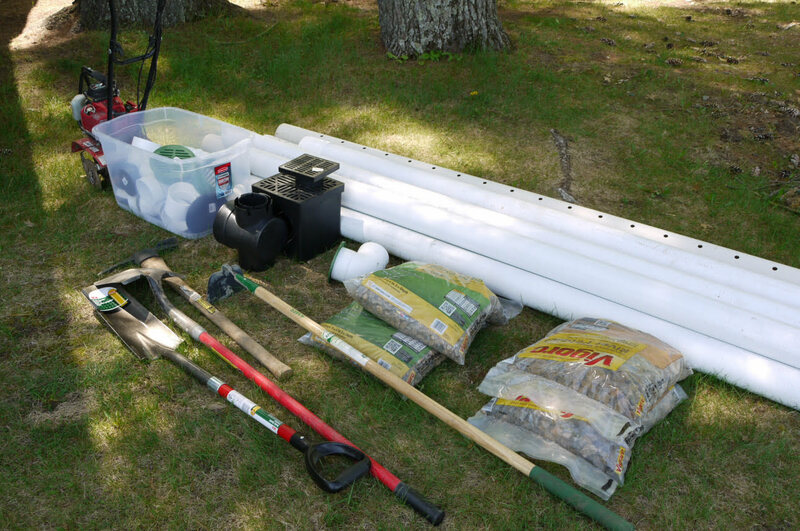 Consider the goal of the drain system and plan your system accordingly. French drains should be used to remedy sub-surface water issues. Place the drain at or below the desired de-watering level. For a foundation, this typically means placing the drain pipe at a depth at or below the bottom edge of the foundation wall. French drain to be located near the bottom of the cabin foundation wall along a portion of northwest wall of the cabin. When planning your drain system, consider the discharge circuit path and eventual location. The water collected by the perforated pipe in the drain trench will need to empty somewhere. And for most systems, this means a drain and discharge circuit that can drain to gravity. The specifics of your landscape and desired system size may limit the practical depth of the French drain system. For my system, I chose to send this water to a downhill, lateral daylight yard location approximately 15 feet away from the house. My discharge target was a bit more than a foot lower than the elevation of the drain, and I plan to trench solid pipe to this spot and cap the pipe with an elbow and pop-up discharge emitter. Both the French drain and the discharge circuit should slope at least 1% – 2% (~ 1/8 – 1/4 inch per foot) toward the discharge location. Other discharge options include; submerged dry wells, water gardens, storm sewers or other options. Check local codes to ensure compliance with storm water regulations. French drain systems should be sized to accommodate expected water flow and span the problem area you intend to drain. 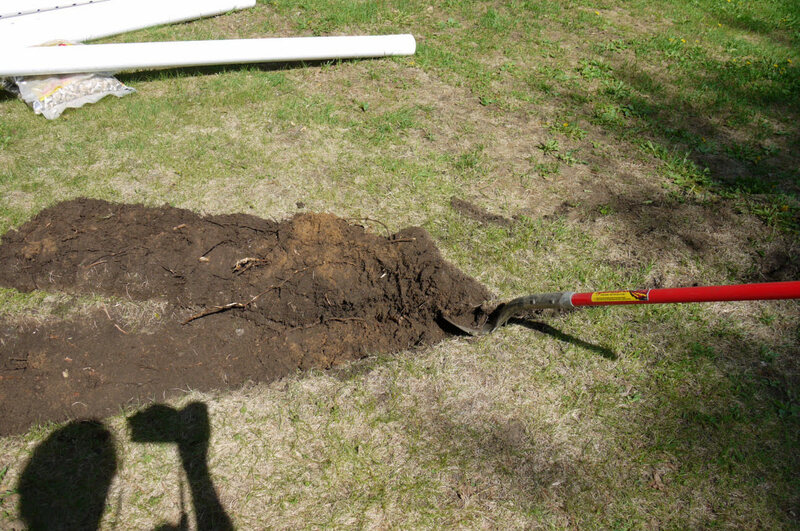 Trenched drains should typically be at least the width of a standard shovel (9″) and wider for wetter areas. The depth of the trench depends on the goal of the drain. The drain depth should be deeper than the crawl space surface you are attempting to dry. Other considerations include the slope need for the discharge circuit and the building foundation depth. 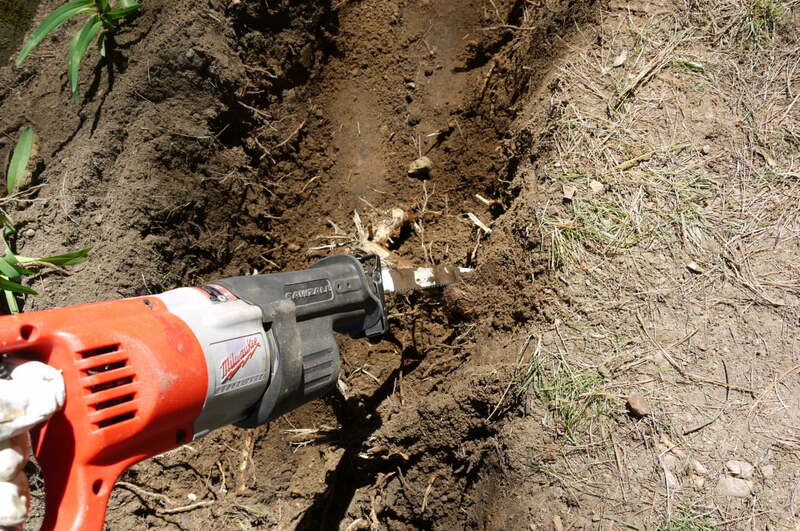 To dig the French drain trench, I started with my Honda Harmony mini tiller. The rototiller made the first layer of digging much easier. Continue the trench to obtain sufficient depth for your project. 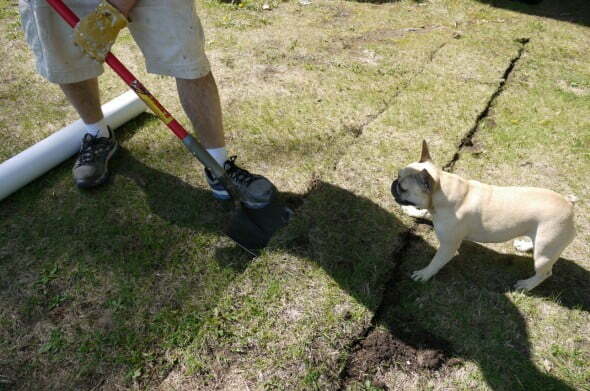 When digging, you will also need to allow for proper pipe sloping toward the drainage circuit. 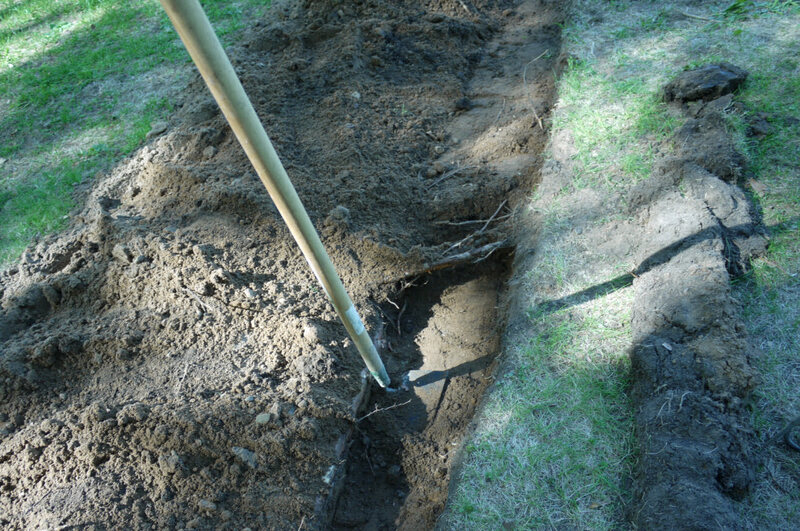 Use stakes and string to help track slope and proper depth. 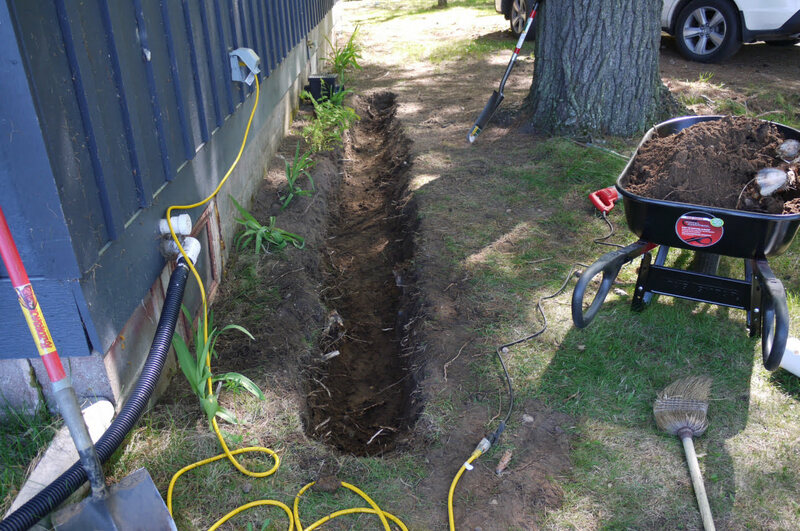 For my project, the 9″ mini rototiller combined with hand digging, produced a trench that was between 12″ and 14″ wide at the surface. The depth of my trench varied between 16″ and 20″ and was dug with an approximate 2% slope to accommodate a 1/4″ of drop per foot of pipe run. Trenching complete! 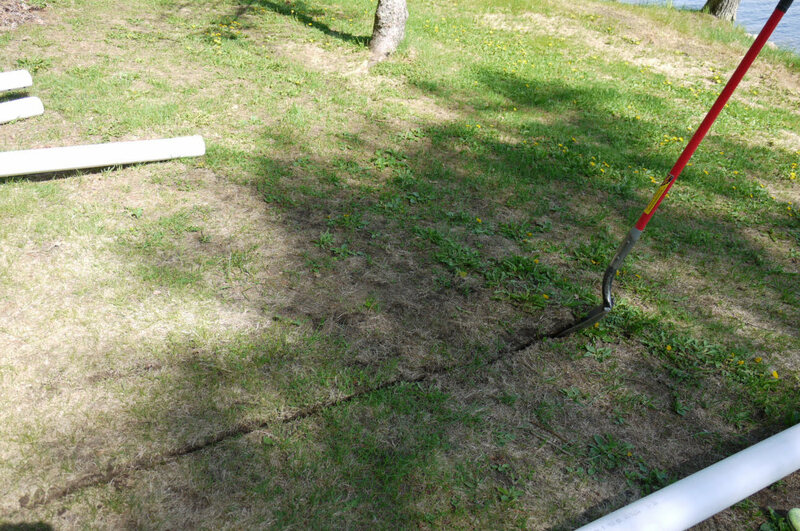 Use stakes and string to ensure adequate slope for the drain and discharge circuits. 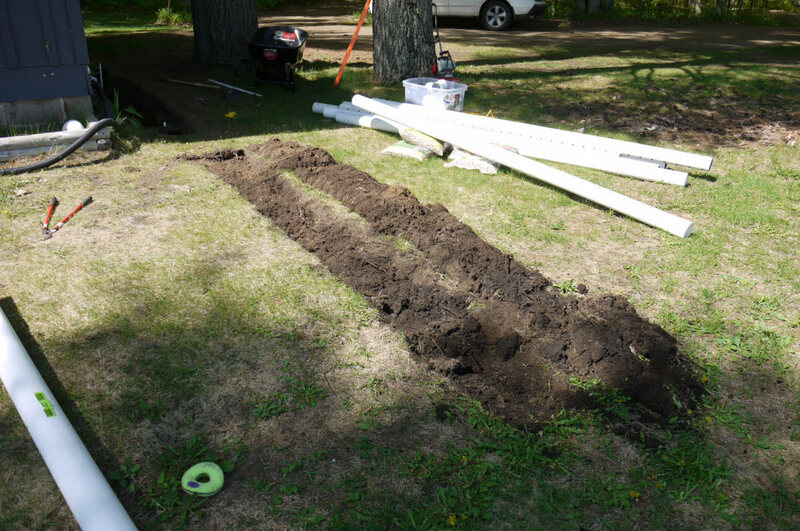 Prior to installing the drain, assemble the French drain system next to the foundation of the building I plan to drain. 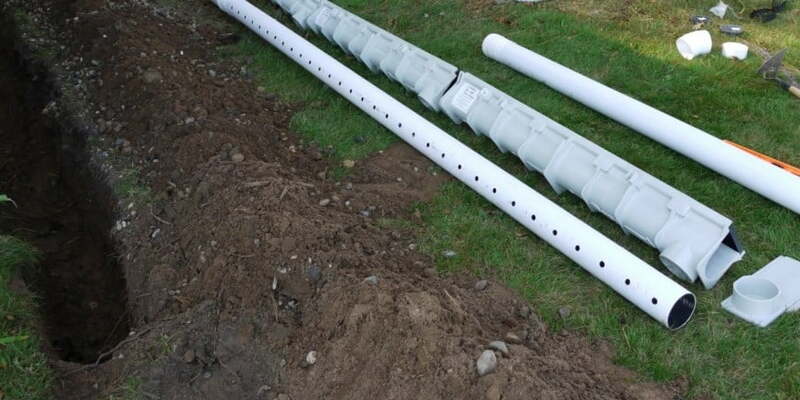 The build of the French drain is simple: surround a buried, sloped drain (perforated 4″ HDPE triple wall drain pipe) with water permeable aggregate (gravel) in a trench at the level of desired de-watering. Cover the trench and direct the discharge away from the area. 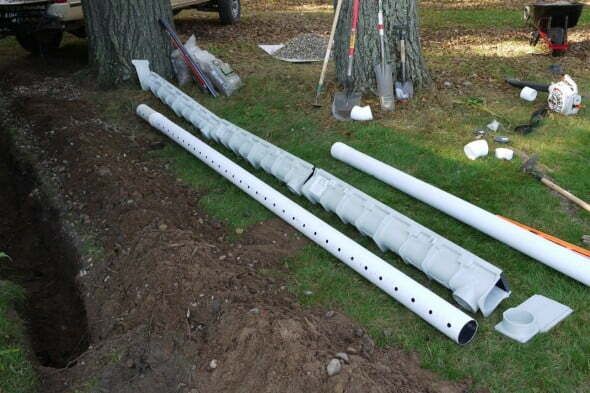 When constructing your French drain, orient the pipe with the drain perforations down. Water will enter these holes at the bottom of the pipe and flow downhill at the base of the pipe between these two rows of holes. 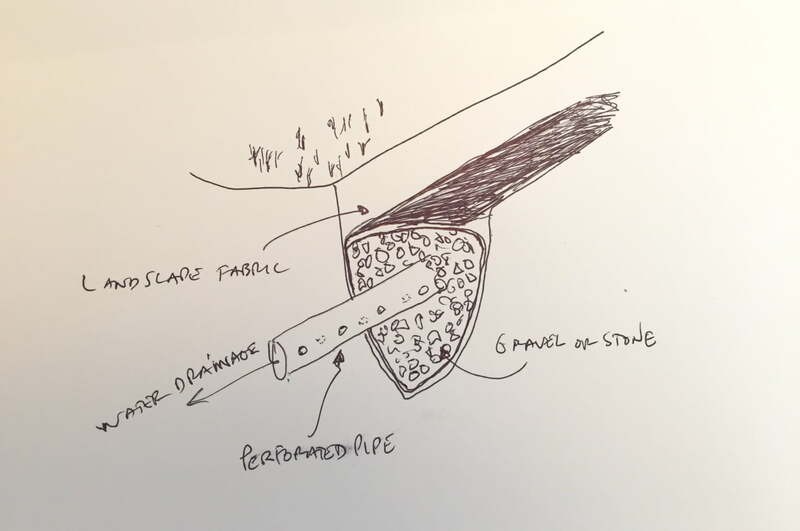 The drain pipe can be covered with fabric (sock) to help reduce sediment entry into the system and help avoid plugging. Alternatively, the trench can be lined with fabric (landscaping fabric) and wrapped around the aggregate surrounding the pipe. 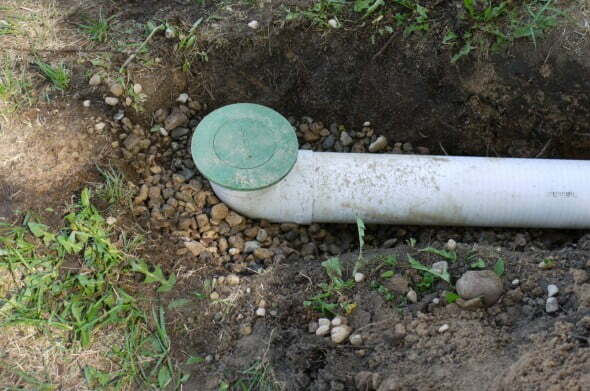 Make sure to cover the top of the pipe as much of the sediment enters from the area above the drain pipe from the soil. Once the pipe is surrounded with aggregate (stone or gravel), the top of the trench can be closed as you like. 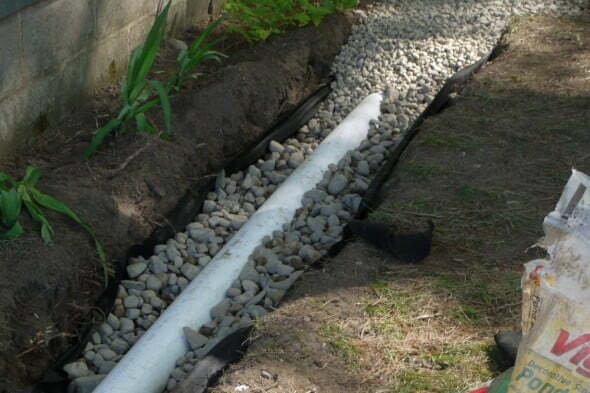 French drain construction showing the addition of rock and gravel around drain pipe. Once the French drain is installed, close the trench and finish the surface of the drain. 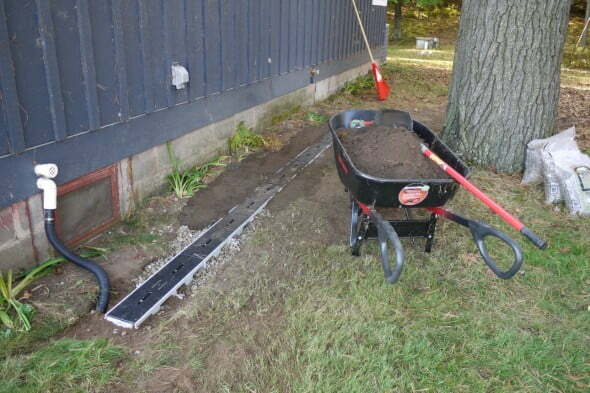 Because the French drain is draining water below the surface, there is no need to fill the entire trench with gravel. Refill the top of the trench with dirt and finish the surface as you wish. Cover the top with grass or other vegetation if you like. I plan to install a surface drain at the top of this trench and, therefore, will not fill in the top of the trench just yet. 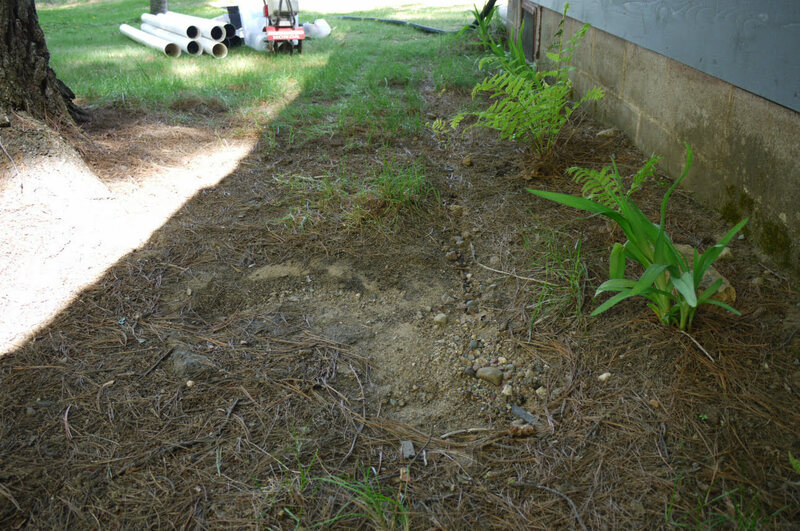 See below for the addition of a surface channel drain to the top of this trench above the buried French drain. Once the drain is built, connect the drain to a discharge pipe to divert the water to its eventual destination. For this system, I connected the French drain (and the surface drain I will install next) to a buried 4″ solid triple wall HDPE drain discharge pipe. 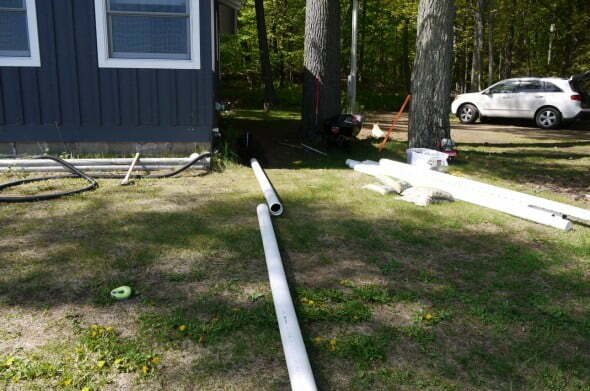 This discharge pipe will carry the water to a low, sloped area of the yard about 15 feet away from the cabin. Continue reading below for a complete discussion of the discharge circuit creation. Decide on the location for the surface drain. For me, I was interested in catching roof run-off from our gutterless roof. 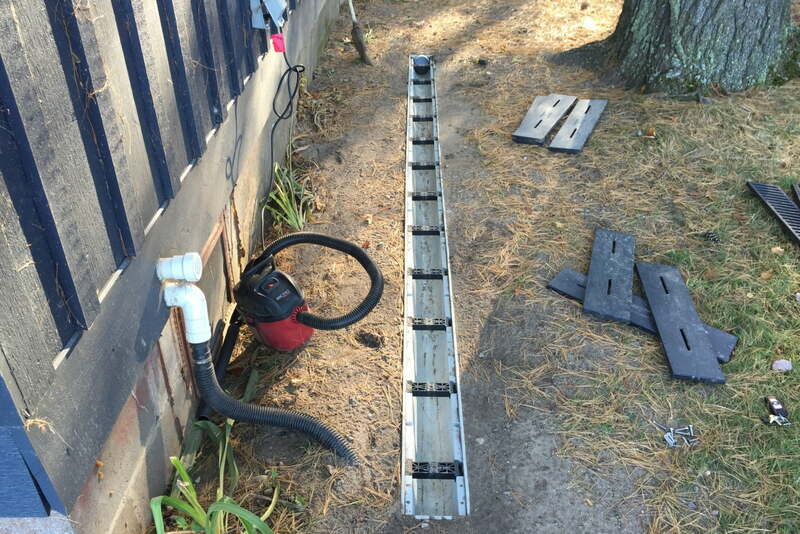 I measured the length of surface drain I would need to cover the drip line from the draining section of the cabin roof and ordered a channel drain system from NDS. The system I purchased is the Dura Slope trench drain system from NDS. This system is a modular, snap-together system of pre-sloped 6″ wide drain trenches. The system is built for commercial use and is very durable. This system should provide more than enough capacity for most residential projects. The beauty of the Dura Slope system is the built-in slope that allows it to be installed flush with the ground and still drain toward a desired discharge. The system offers a variety of finish options with a variety of grates and colors. 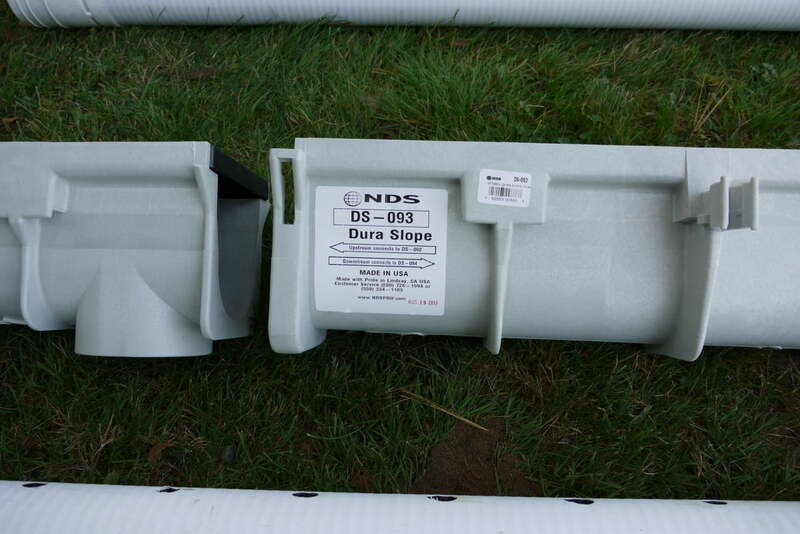 The Dura Slope Channel drain system is designed to be installed within a bed of concrete. While this is an option for installation, I chose to install the channel sections in a bed of small stones, sand and topsoil. If you will be installing the system in an area of foot traffic or vehicle traffic, consider mounting the system within a concrete bed as recommended by the manufacturer. 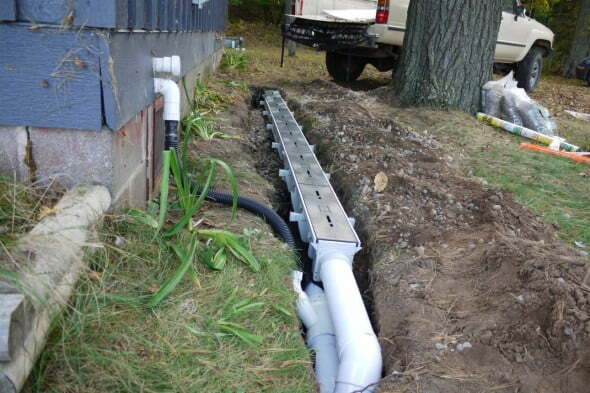 Install the system to match the desired water path. If the system will be catching water from the roof and run-off away from the home, it should be installed on the down slope of the water path. As mentioned above, I did not install the system in concrete but rather used a mix of rock, sand first and then black dirt for the top most several inches to bury the drain. When filling in the sand and rock mixture around the drain, take the time to pack the fill to provide a secure install for the drain. 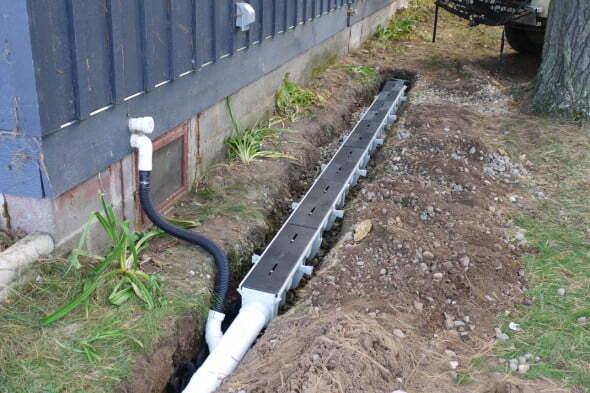 With this surface drain, the goal of the system should be to capture as much water as possible from the immediate and surround ground area before it passing into the ground. With this in mind, the surface of the surrounding ground will be finished with grass and slope to the drain on both sides. Once the surface of the ground is level, packed and sloped to your liking (typically away from the home and toward the drain system) finish the ground as desired. When deciding on a finish for the top surface around the drain, consider the main goal of moving the water into the drain before it passes into the ground. An ideal finish would be a non-porous, flat, sloped surface like finished concrete or tile. Other considerations include the potential for splash from the roof run-off staining the lower portion of siding on your home. I chose to finish the area around the drain with grass to help conceal the drain grates and to limit splash from roof run-off. The channel sections come from the factory with a protective black plastic cover grates mounted on the top of the drain sections (see photo above). These factory cover grates protect the drain from debris, dirt, concrete, etc. during the installation process. Once you install is complete, remove these protective covers, clean the drain channel and install the top grates on the drain sections. To finish the surface channel drain, I installed black plastic grates from NDS made for the Dura Slope product. One caution – you will need two grates for each section of the drain (grates are 2′ and drain sections are 4′ — learned the hard way). I also plan to leave the grates exposed (at least at first). I may decide to cover the grates with rock or over landscaping fabric or similar if I find the grates to difficult to keep clean and free of leaves, etc. 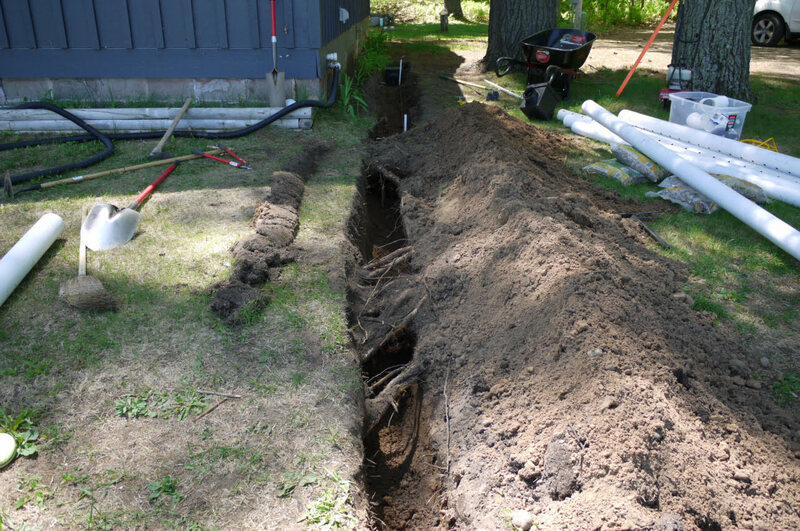 Prior to completing the above drain system, the surface channel drain, and the deep French drain were connected to a discharge pipe. This discharge circuit will carry the water away from the home and discharge it in the yard. Continue reading below for more information regarding the discharge circuit construction. Pick a termination point for the discharge trench. 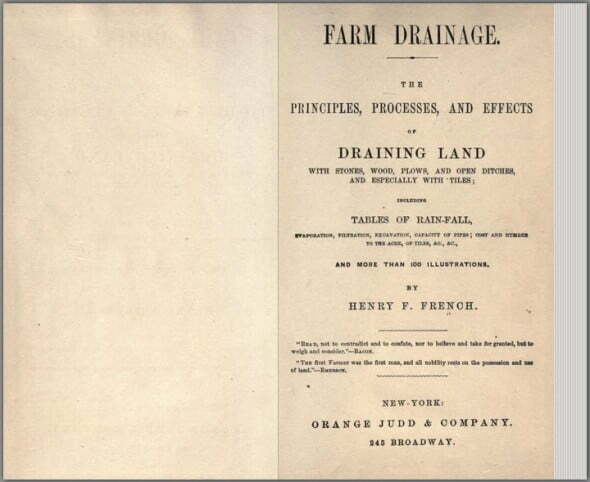 Typically this would be a location with natural drainage, a submerged dry well, water garden or similar discharge location. 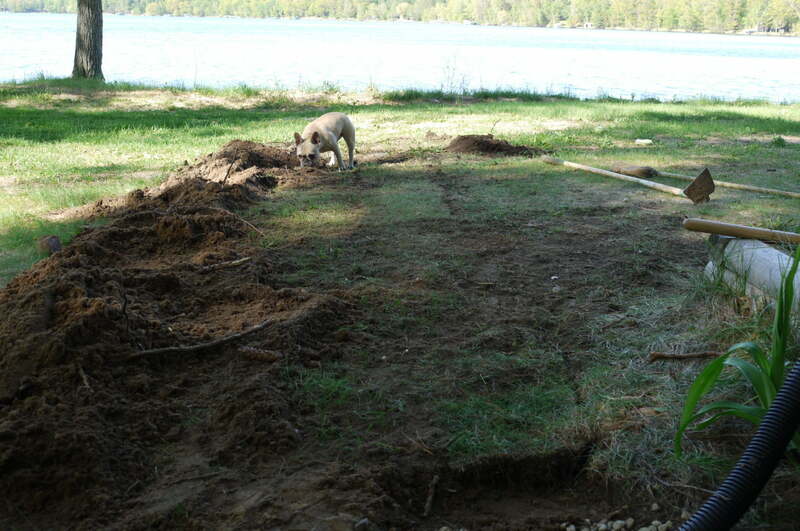 For this project, I chose a sloped, low position in the yard ~ 15 feet away from the cabin. Then, plan a path from the drain(s) to this discharge destination. If possible, choose a straight path and use smooth wall pipe (I used 4″ triple wall HDPE) instead of a corrugated plastic pipe. If not already done, dig the discharge circuit trench. Keep in mind the recommended 1% – 2% slope (1% minimum for smooth wall pipe and 2% minimum for corrugated pipe) needed to move water from the drain to the discharge area. 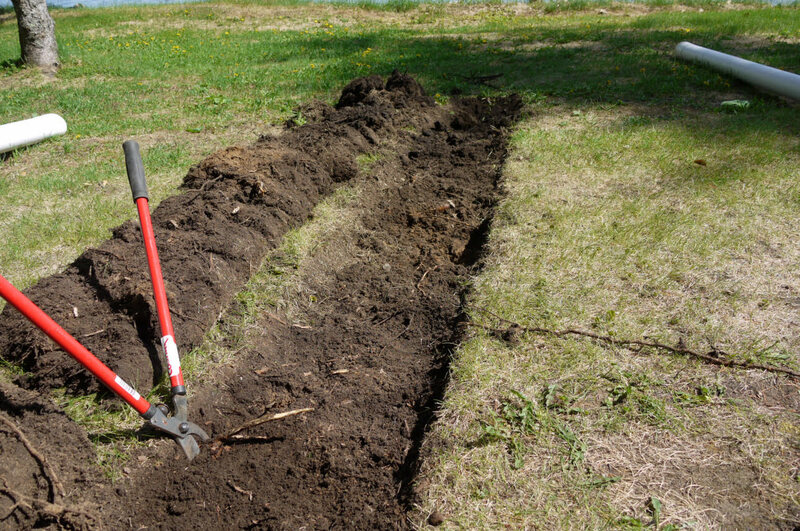 When digging the discharge trench, take the time to cut the sod for reuse. 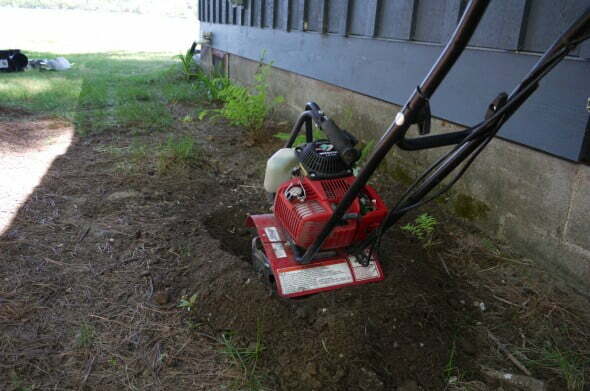 Use a shovel to under-cut the sod at a depth deep enough to preserve the roots of the grass. 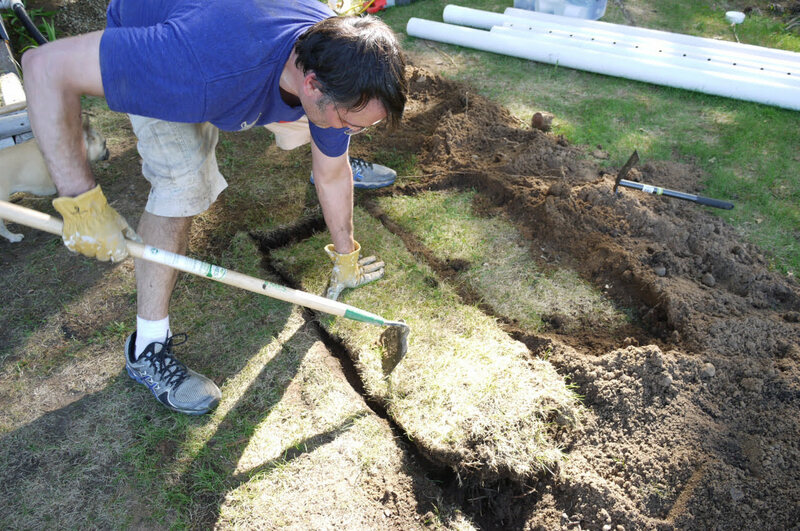 Once free, flip the sections of sod over to re-use after the trench is closed and to help keep the sod from drying out. Trenching shovel used to dig trench for discharge pipe run. Notice the heavy roots that were saved over the trench. A perfect system may benefit from having separate discharge pipes for each drain, but I chose to combine both of the drains and the sump pump line from the crawl space into the same 4″ discharge circuit. If you are trying a sump pump line into the discharge line be sure to design the system to avoid backflow of drain water into your sump. Use gravity to avoid back flow and install the proper check valve in the sump pump discharge circuit. Once the trench is the proper depth with the proper slope, connect the discharge pipe and install in the discharge trench. If using bell end triple wall HDPE drain pipe be sure to use the solid pipe. 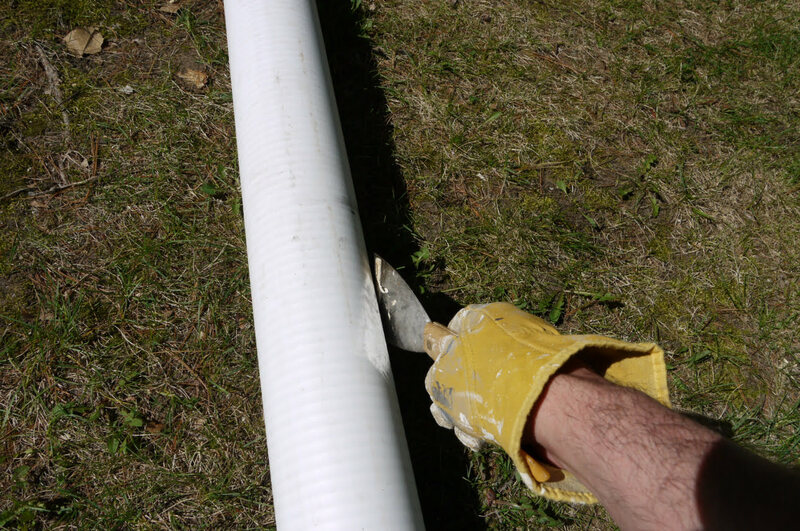 Do not use the perforated pipe with the two rows of drainage holes used for French drains. Install the pipe so the bell-end connectors are uphill. At the discharge end of the discharge pipe, I used a 4″ pop-up emitter (from NDS) that will open with water flow and keep the system closed when empty. 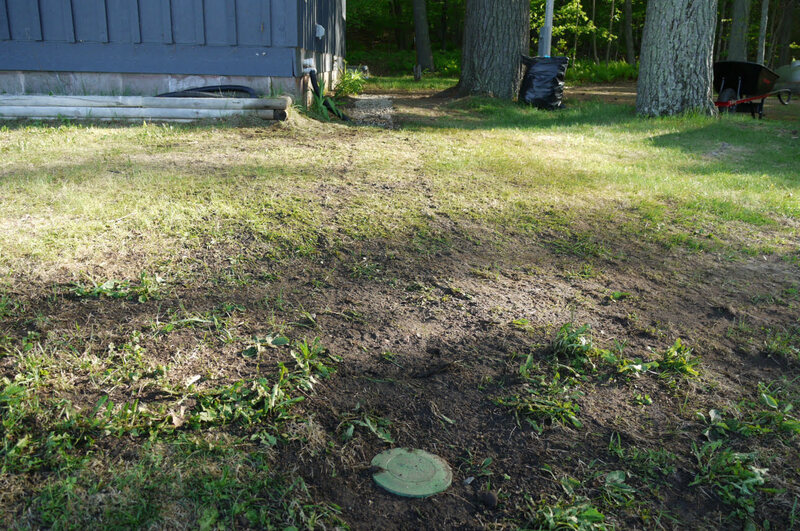 Install the emitter flush to the ground to avoid tripping on the cap or causing problems when mowing the lawn. 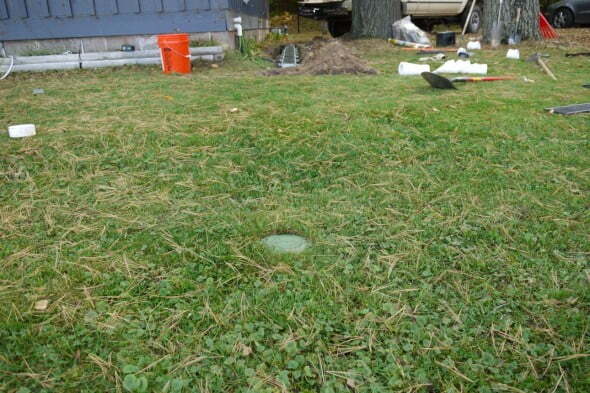 View of in ground pop-up emitter cover at end of discharge circuit in yard after grass has grown in. 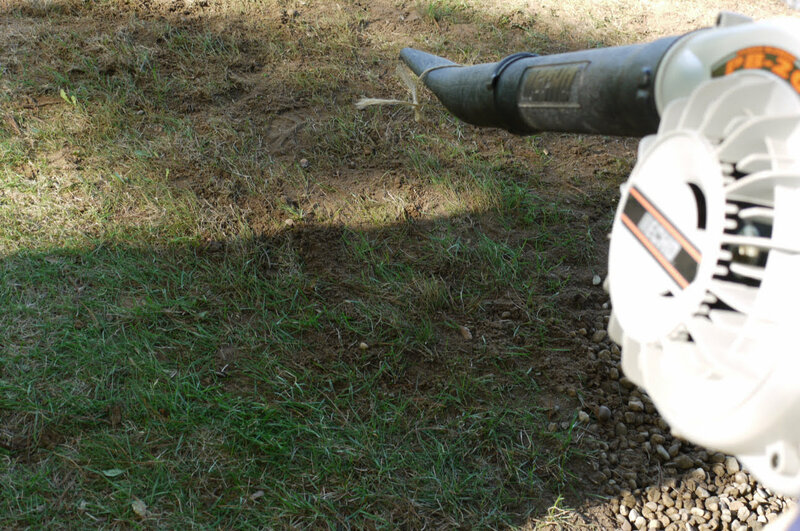 Completed use of rototiller to dig top of trench for french drain. This is exactly what I had in mind for my cabin! I’m curious to know how it worked out for you?